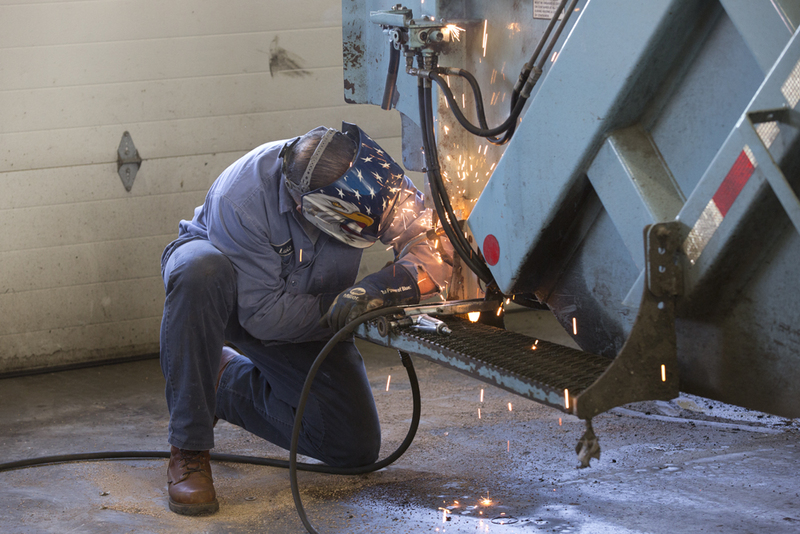 City blacksmith Luke Gawel welds a step back on to a garbage truck. This is one of the smaller jobs a city blacksmith can do, he says. Our questioner, Joel, describes himself as a nerdy, curious guy who likes playing with data. When the City of Chicago published its payroll data, he thought it would be fun to look and see what was there. And he did find a surprise. The word “blacksmith” conjures up an image of glowing-hot metal getting pulled from a big furnace and pounded into some usable shape — maybe a horseshoe — on an anvil. Maybe the light in this image comes from the furnace flame, since blacksmithing thrived for millennia before electric lights. The whole scene seems ancient, or at least old-fashioned. So, why would the notoriously cash-strapped City of Chicago employ more than 20 of them, at salaries of about $90,000 a year? That’s the essence of the question we got from Joel. He’s asked us not to use his last name because he works for local government, and his boss, understandably, thought the question might make political higher-ups uncomfortable. Again, Joel promises he wasn’t being snarky, just curious. Still, the city’s mounted police unit only has about 30 horses: How many horseshoes could they need? It turns out, there’s a perfectly-reasonable story — or, almost-perfectly-reasonable — and it has nothing to do with horseshoes. (The city hires a farrier for that trade). In pursuing it, we did find a living link from the ancient art of blacksmithing to the city’s operations. So, then: What do the city’s full-time blacksmiths actually do? 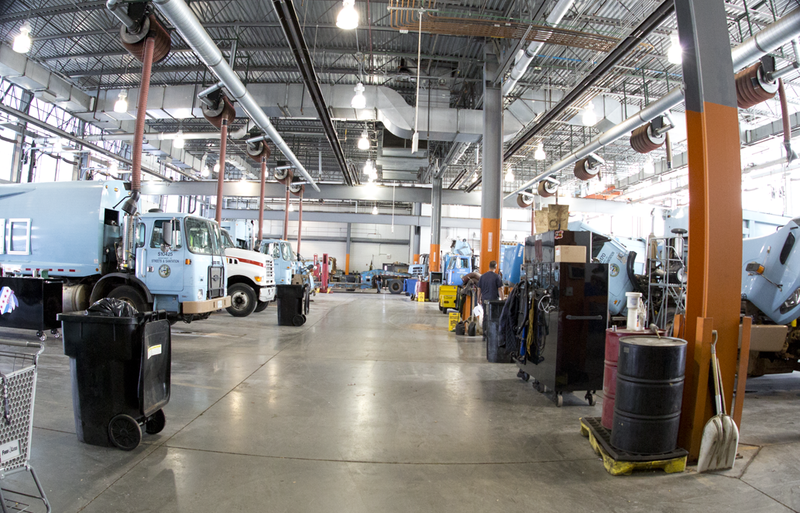 To find out, I visit blacksmith Luke Gawel at his work — a city plant at 52nd Street and Western Avenue, with two giant repair bays for trucks. On the day I visit, Gawel has picked a small job to demonstrate what he does: welding a step back onto a garbage truck — the kind a worker rides on, at the back. This is a small job, but Gawel spends a lot of time on bigger ones: replacing the sides of trucks, the floors, the big mechanical elements in back of a garbage truck that smush the trash. If you can’t repair these big, basic parts, you’d have to junk the whole vehicle. With a city fleet that includes 477 garbage trucks, 203 fire engines, 101 street sweepers, and 122 ambulances, Gawel and his colleagues have plenty to do. In the winter, the city adds 333 salt spreaders and snow plows to the fleet — what Gawel’s boss calls “wear items” — and twenty full-time blacksmiths isn’t enough. The overtime numbers are insane: more than $65,000 just for February 2015. Is ‘blacksmith’ the right word? Given that the city’s “blacksmiths” clearly spend the vast majority of their time welding, why not dispense with calling them such? After all, the number of workers employed as blacksmiths is clearly on the downswing. 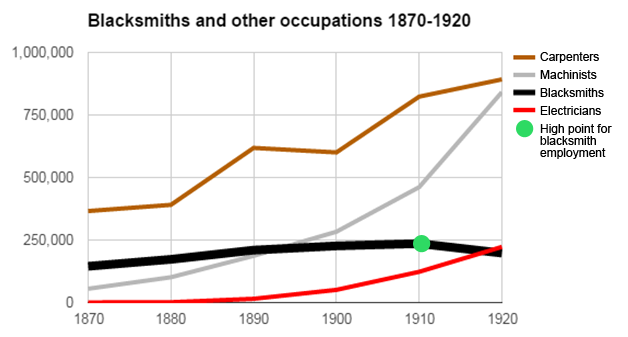 The number of full-time blacksmiths in the U.S. peaked about a hundred years ago, when the U.S. Census Bureau counted 235,804. Forty years later, in 1950, the Bureau of Labor Statistics found that fewer than one in five of those jobs remained. Following another thirty years of decline, the BLS found that three-quarters of those jobs were gone too, and it stopped counting. Until he came to work for the city, Luke Gawel would not have counted himself among this ancient and dying breed, although the work he did in previous jobs was quite similar to what he now does for the city. In fact, he stumbled onto this job because he found the job title just as incongruous — just as curious — as Joel did. So, why does the City of Chicago still use the title “blacksmith”? You could translate that answer as: bureaucratic inertia. Changing it hasn’t come up, and could be a hassle. However, Burns says the outdated title is not causing the kind of problem that would get his attention. “I don’t remember anyone saying we need a new title because we’re not attracting candidates,” he says. Last of the real city blacksmiths? I did talk with someone who worked the “obsolete” forge that city blacksmith Chuck Miggins remembers — a person who connects Miggins and Luke Gawel with the ancient image of a man (or a Roman god or Celtic goddess) pounding on glowing-hot metal. “We always had somebody working on the fire, who worked the forge,” says Richard Pozniak, who retired from the city’s blacksmith force in 1993. The man on the fire would “do things like straighten bumpers, make chains, special hooks,” he says. 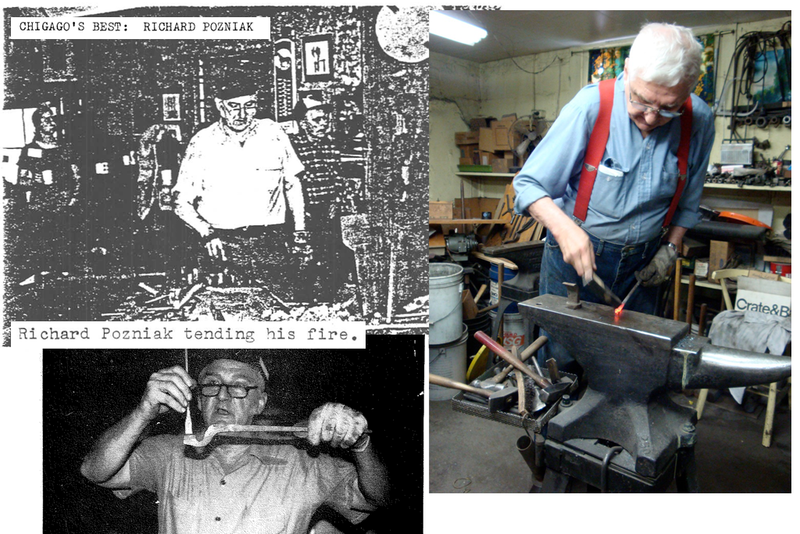 “I was one of the last ones working on the fire.” When Pozniak signed on with the city in 1950, old-school blacksmiths were already almost gone. Just one — out of what he remembers as 30 or 40 city blacksmiths. The rest were already doing basically the same work that Luke Gawel and Chuck Miggins do today: cutting pieces with gas torches, joining them with welds. That’s how Richard Pozniak spent his first ten years as a city blacksmith, but working on the fire had always been his goal. When his chance came, about ten years into his service with the city, he took it, and kept it till he retired. 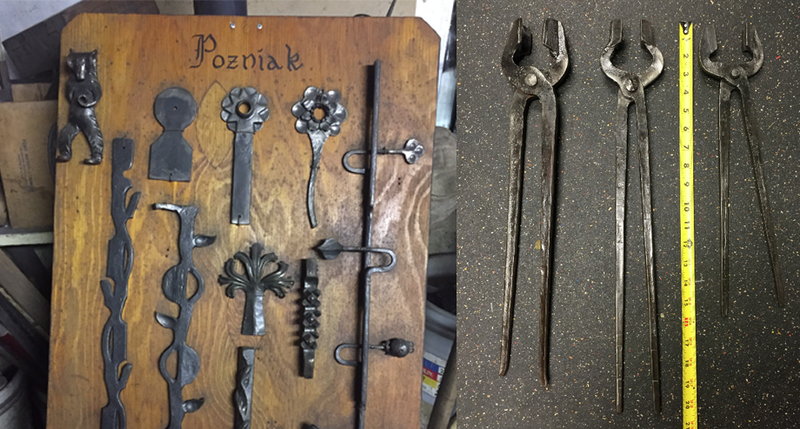 A few years afterwards, the city idled its forge, but Richard Pozniak kept working his own fire — in a shop in his basement — making decorative items and tools. Until now. At age 85, he’s closing up shop. Over the years, peers in the blacksmithing world had referred to him as a master. Among the tools that Richard Pozniak made are tongs of his own design, which artisan blacksmiths and hobbyists around the country now make and use. They’re known as Poz tongs. For more about Richard Pozniak, check out this story about him from the show Studio 360, by his son-in-law, radio producer Peter Clowney.